Friday. Today is the release of season four of Fuller House. Luciana has been obsessing about this for weeks and is so excited that it is finally out. She has asked for weeks on a status every day. I had to be up really early this morning to do some work. So I started my day before six in the morning. I worked for a few hours and had originally thought that I was going to take a nap after some work, but the work ended up going on for so long that I decided that I might as well just stay up and work. 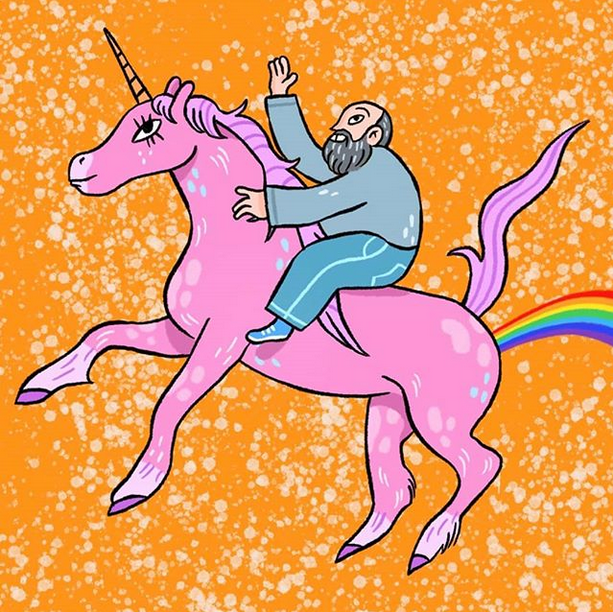 Today, Valentina made a new drawing of me riding a unicorn farting a rainbow for an advertising campaign. Luciana says that she wants a poster of it for her bedroom. I love it, it is so cool. It got a lot of love on Instagram, too. But we could not drop everything and spend the day watching Netflix. It was a work day first. GOG’s Winter Sale gave away Full Throttle Remastered for free today which is amazing, because this was one of my absolutely most desired games to get on my wishlist this year and I totally got it for free! GOG is the best. I managed to work through a couple more boxes today of stuff that moved down from New York. The progress on all of that is very slow, but at least there is progress. Once we head down to Houston there is going to be a lot more space in the garage to move around and get things sorted and cleaned because Francesca has three large pieces of furniture at the end of the garage that is in the way. Paul is going to drive that all down in his truck. So that will make cleaning up the garage so much easier. Paul has gotten everything that we need to use the shelves that we currently have now, so that is going to accelerate things quite a lot as we can put books and such onto shelves now. We had only been able to use half of our shelving capacity since getting down from New York because the little nubs that hold up the shelves have been missing. And now that some desks have been moved in and assembled in the dining room we already have a bit more room. Paul is thinking that two more, large metal racks will go into the garage along the inside wall towards my office and once we do that we should be in good shape. We are already getting to the point where we are just about to need to start the process of converting the DVDs that are in boxes. The game plan is to go DVD by DVD and get it moved over to the NAS. Then put the DVD itself onto a spindle to compress the physical space that it takes up and to throw out the plastic box that they are all in. That, alone, might clear out a quarter of the garage and make all of the extra space just “go away.” That is a year long project at least. Once the DVDs are completed, then the same thing needs to happen with CDs. Only we don’t plan on throwing out the cases. Those, we think, will move up to the attic into deep storage. Then the kids can deal with them sometime in the indefinite future when they have to clean out our house after we have gone. I got my office cleaned up a bit today. It has been a bit hard to work in there as it was so crowded. It is still a mess, but far better now. I can walk to my desk, at least, now. This evening Dominica made muzi muzi for dinner and the family settled in to all watch the fourth season of Fuller House together. We’ve all been waiting a long time for this. So we did that until it was time for bed. I needed to go to bed on the early side tonight as I was pretty tired after only getting a few hours last night and working a very long day. Once the kids went to bed, Dominica and I watched The Ballad of Buster Scruggs on Netflix which just released recently. It was well shot and has some amazing acting and footage. But, overall, it was not very interesting. Most of the stories were overly predictable, gory, and depressing. It is six short stories, but almost no story is really ever told. It was a selection of quality cinema vignettes, but it lacked real substance. If you are really into film as a study, it is pretty good quality. But as something to watch for enjoyment, it’s just lacking.